We have a serious pizza monkey on our back. Is it very obvious? 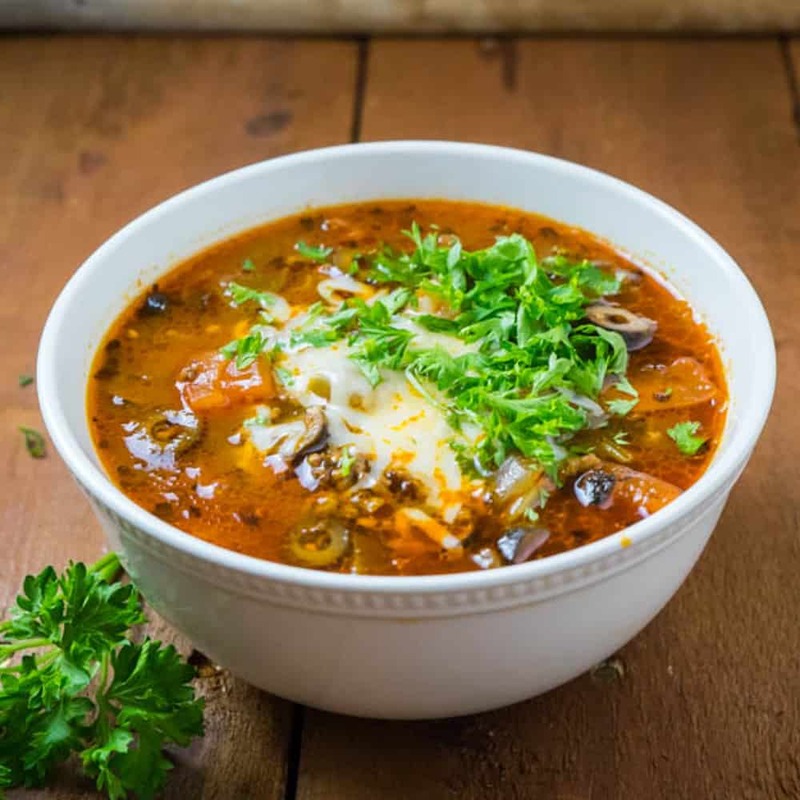 What originally started as an idea to convert our favorite Subway sub, “Pizza Sub”, into a healthier meal, ended up as this masterpiece – Caesar’s Pizza Soup. 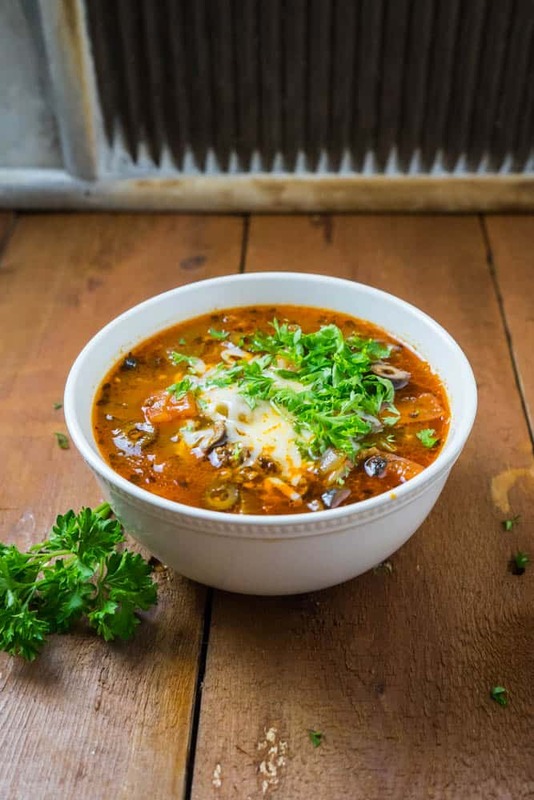 We could’ve just called it an Italian Pizza Soup, but we wanted to be fancy. Ground beef, tomato, onion, celery, garlic, green chili, black olives, oregano and pickles. Yes, pickles. Just trust us on this one. Unless you are deathly allergic to pickles – PUT. IN. THE. PICKLES. It’s the secret ingredient that takes this soup ten levels above any other soup you’ve ever eaten. Cody is obsessed with it. Even though I’ve mentioned before that he is a world class taste tester, he’s also a slightly picky eater and is very “flavor-oriented”. If he loves something, you better believe it’s amazing. I could live off soup. One of my favorite thing in life to create new soups and I am extremely proud of this creation. Chop up some stuff, throw it in a pot, add water and let it be. Return an hour later to find a wonderful, flavorful and aromatic meal ready to be devoured. I love it. If you want to eat a healthy pizza meal for breakfast, you should most definitely go give our Mini Pizza Crustless Quiche a try! And if you’re in the mood for another comfort-food-turned-healthy-soup, I recommend our Chicken Taco Soup. As much as I love this Pizza Soup, I can’t really decide which one I love more. The Taco or the Pizza Soup. I guess this is what they mean when they say you love all your children equally. Yes, my recipes are my babies. No, I’m not being weird. My very favorite thing about this soup is the melty mozzarella cheese that stretches from the bowl with every spoonful you take. It really gives the illusion of eating a real pizza. Mmmmmm…..heaven. Ok, I’ll stop rambling and let you get on with the cooking! Brown the ground beef in a hot pot. Throw everything, but the cheese and parsley, in the pot and bring to the boil. Lower heat and simmer for 1 hour. Scoop into bowls, add mozzarella on top and garnish with parsley. Caesar’s Pizza Soup – Pin it! What a lovely cheesy soup. Ummm… so delicious. Thanks for sharing it. Do you have serving size and calories per serving? Hi Debbie! Not for this one yet, but I’m currently working on adding nutrition labels to all my recipes.